No other vase of this design and with this glaze appears to be published. This vase is an excellent example of the effect created by using the intaglio form of decoration on a monochrome porcelain vessel, to create two different shades of green from the same glaze, while simultaneously accentuating the dense archaistic designs on the domed body and upper bulb. It is, nevertheless, based on a slightly earlier Yongzheng-marked double-gourd shaped vase with a more rounded base, covered with relief-decoration of foliate scrolls and a pale green glaze. Examples of these vases include one in Beijing, illustrated in Monochrome Porcelain, The Complete Collection of Treasures of the Palace Museum, Hong Kong, 1999, pl. 130; and another sold at Sotheby's Hong Kong, An Important Private Collection, 17 May 1988, lot 70. The rare form of the present vase, with the truncated lower bulb, is recorded in a number of different decorative styles. 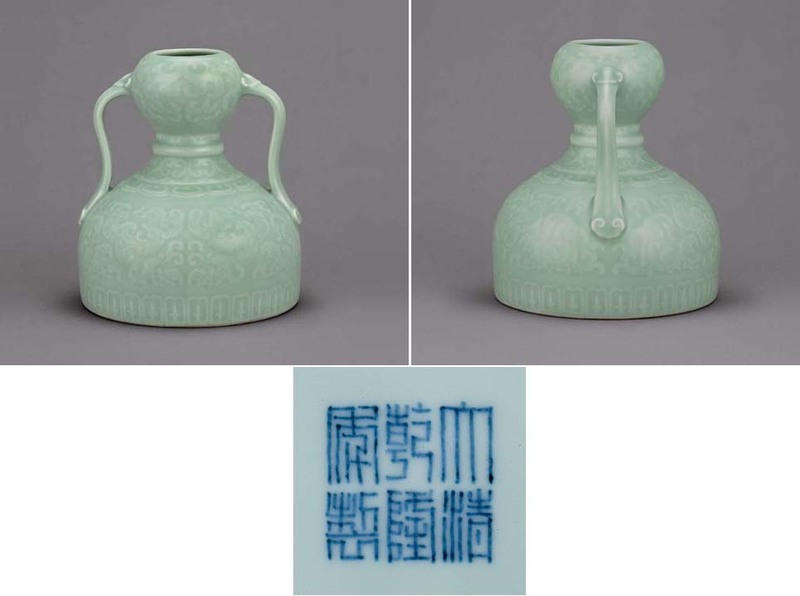 Examples covered in teadust glazes include a pair of Yongzheng-period vases illustrated in Chinese Ceramics in the Idemitsu Collection, Japan, 1987, fig. 961; a Qianlong-marked one from the J. E. Hotung Collection, was included in the Min Chiu Society Silver Jubilee Anniversary Exhibition, An Anthology of Chinese Art, Hong Kong Museum of Art, 1985, illustrated in the Catalogue, no. 188, and subsequently sold in these Rooms, The Imperial Sale, 30 May 2006, lot 1253. A version embellished with doucai enamels from the Chang Foundation is illustrated in Selected Chinese Ceramics from Han to Qing Dynasties, Taiwan, 1990, pl. 160; while blue and white examples have been sold in these Rooms, The Imperial Sale, 27 April 1997, lot 77, and 27 October 2003, lot 634.